RAY Organic Heirloom Pillow "Dhyana Vision"
RAY Organic Heirloom Pillows are 24" x 24" machine quilted functional works of art designed to bring simplicity and harmony to your home. Each pillow is hand crafted with a 100% organic cotton front, and a durable canvas back. We make our own pillow forms using organic muslin stuffed with 1.5 lbs of raw cotton. The pillows are finished with a sturdy and stylish YKK brass zipper along the bottom edge for ease of removal and cleaning of the pillow cover. This design is from the 2016 RAY Organic Heirloom Collection, available at The Wexner Center for the Arts Store (Columbus, Ohio). New pillow designs for 2017 will be released very soon. 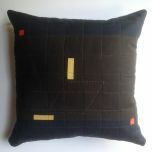 RAY Organic Heirloom Pillow "Deserted and Quiet Place"